Kundalini Yoga means the raising of Kundalini energy. Kundalini energy is one's dormant spiritual energy. The Kundalini energy in its' dormant state is visualized as a snake coiled up in the first chakra at the base of the spine, the Muladhara chakra. When an aspirant of Kundalini Yoga starts activating the Kundalini energy through various kinds of pranayamas, the nadi system is vitalized. The roused Kundalini energy moves upwards in the central nadi, the Sushumna, passing through each of the lower chakras to reach the seventh, the Sahasrara Chakra. This process is known in Kundalini Yoga as the piercing of the chakras and represents the merging of the female with the male. The release and ascent of the dormant spiritual Kundalini energy in Kundalini Yoga enables the aspirant to transcend the effects of the elements and achieve consciousness that brings liberation from the ever-changing world of illusion (Maya). Laya Yoga is also called Kundalini yoga, because the raising of Kundalini energy to unite her with the supreme consciousness is the main objective, which is reached through deep meditation (dhyana). For a better understanding of Kundalini Yoga, also read The Chakras. 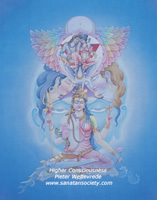 as well as clear information on the awakening of Kundalini energy through purification of body and mind through daily Kundalini Yoga practices and meditation techniques. Click here for all extracts from this book.